B&W print depicts two unknown women posing beside a car. Side view of a brown bus with a sign which says: "Fortress of, Forteresse de Louisbourg"
Colour Kodachrome 35mm slide depicts the side view of a brown bus with a sign which says: "Fortress of, Forteresse de Louisbourg". Possibly on Cape Breton Island, part of Nova Scotia. Colour Kodachrome 35mm slide depicts unknown people standing around a red truck. Colour Ektachrome 35mm slide depicts a group of unknown people standing in front of a yellow truck. There is a white house with a red roof and red trim in the background and a person is leaning on the house. 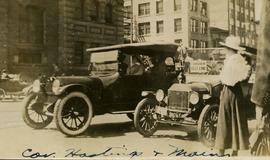 B&W print depicts unknown people in a car with the license plate 8738. "Harrison Hot Springs" is written along the bottom of the image.Note: colour adjusted on jpg. B&W print depicts Dr. Robert Franks holding a cigarette and posing in front of a car. Colour Kodachrome 35mm slide depicts St. Basil's Cathedral with tour buses parked in the foreground, in the Red Square. Colour Kodachrome 35mm slide depicts a military vehicle in front of the Trans-Siberian train station in Irkutsk.Note for slide reads: "We then asked to be taken to Trans-Siberian Station. The word 'Irkutsk' is on top of Station."